Posted on Wednesday, July 01, 2015 by "T". Las Vegas resident Brandon Wittmeyer, 31, was crowned the winner of the $1,500 Draftkings 50/50 No-Limit Hold'em event after besting a field of 1,123 entrants in three days of play. It was Wittmeyer's second WSOP final table appearance but his first gold bracelet. In addition, he received $200,618 - the second biggest cash of his career after his 3rd place finish in Event #47 for $215,964. "I've played about eight tournament this year so far. It's amazing to have this happen to me back-to-back making two final tables, and now this," Wittmeyer said. I just thought it would be neat to cash again since they were paying half the field. I didn't expect to come this far again, let alone win it." A total of 562 players cashed in this event. The tournament buying was $1,500 and the minimum cash was $1,000 (282 - 562 finishers). Players got their buy-in back who made it until the top 118, and then earned a profit behind the 117th play position. Aside from the final table finishers, other gold bracelet winners who cashed in the top 100 included - Matt Matros (19th), Dominik Nitsche (24th), Todd Witteles (40th), Scott Montgomery (47th), Kyle Cartwright (67th), and Dutch Boyd (76th). Other notable and recognizable names who cashed included - Jim McManus (writer/author) and Linda Kenney-Baden (famous defense attorney). There were 1,073 males and 50 females who entered this event. The average age of participants was 41 years, slightly older than average. Ages of participants ranged from 21 up to 80-years-old. There were 44 different nations represented in this tournament. 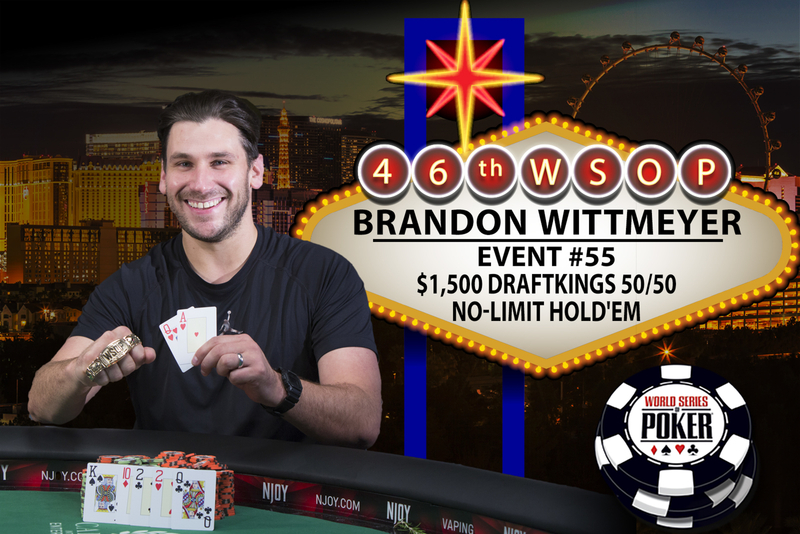 5 comments for "2015 WSOP: Brandon Wittmeyer Wins Event #55: $1,500 Draftkings 50/50 No-Limit Hold''em"
Many congratulations to Brandon Wittmeyer on winning this event and the first place prize money of $200,618. It must be a great feeling to win one of these tourneys, i can but dream!!! Congratulations I think I played more tournaments because it has been very well this award. Would be fun finding out who was the eighty years old participant (I guess he was not Doyle Brunson, he is older than that - besides the article would've mention him) and how frequently does he plays poker during his retirement years. Brandon Wittmeyer is having a great WSOP this year,cashing in four tournaments so far and two big wins of 200k. A quite interesting hendon profile,cashed twice in 2007,2nd one for 17k and then no poker tournaments for 7 years and then loads of small cashes.Whatever he was doing in those 7 years has paid off for him. He is from Chicago originally and now live in Las Vegas. I could say that both cities are full of nice and cozy underground cardrooms, so he probably played 'off the records' 4 a while.